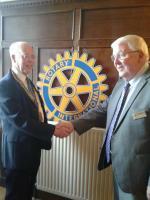 Rotary Club of Dunbar - welcome! Please scroll/swipe down through this page to find out more about us, in addition to the pages linked in the menu, top-left. 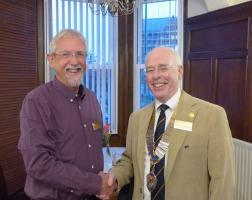 New member Andy Pringle was inducted into the Rotary Club of Dunbar on Monday 24th September. 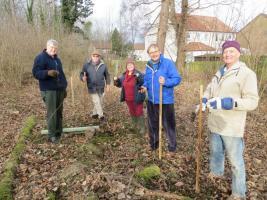 The Rotary Club of Dunbar was established in 1964 and celebrated its 50th anniversary in 2014. 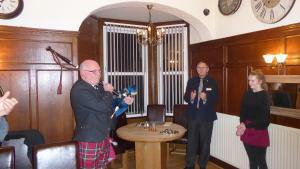 At present the Club has 20 members who meet regularly for dinner every Monday evening at the Hillside Hotel in Dunbar. After the meal there is normally a short talk by an invited speaker, or the time is given over to discusss Club business and future projects. The aim of Rotary is to combine fellowship and fun with service to the community. 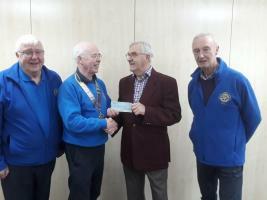 This may involve anything from fund-raising for local community groups or national/international charities to offering a helping hand to other charities or those in need. Rotary Clubs exists all over the world and Rotarians are made welcome by fellow Rotarians wherever they go. Anyone is welcome to join us provided they are prepared to enter into the spirit of Rotary. You can find out more about the activities of the club by clicking on "What We Do" at the top of this page, and then visiting the item NEWS AND REPORTS.